So earlier this morning I noticed that Dropbox was using 100% CPU on my Mac. Checking the Menu Bar icon I noticed that it was stuck syncing on a single folder. 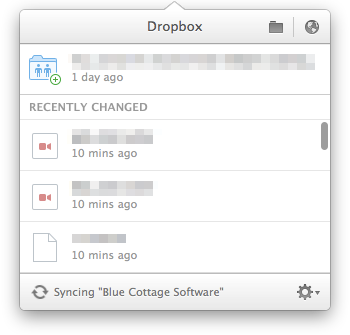 In the end I just traversed the subfolders in the “Blue Cottage Software” folder till I found the one it was stuck syncing on, and renamed it. A quick restart of Dropbox and no more 100% CPU. The only down side is my MacBook doesn’t run all day with the fans on full blast, which means I now have to find another way to keep myself warm during the winter months.